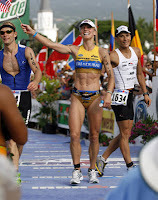 One of the most impressive endurance sports I know of is the Iron Man Triathlon. The participants swim for 2.4 miles, bike for 112 miles, then top it all off by running a 26.2 mile marathon. I'd like to thank the athletes who do this for making those of us who have run marathons feel like slackers. I know this event is pretty extreme for most people, so I am glad that there are shortened versions called sprint triathlons that consist of a 300 meter swim, 10 mile bike, and a 5K run. I've been invited to participate in these mini triathlons over the years, but since I get along in water about as well as the wicked witch of the west, and since I haven't had a decent bike since I was a teenager, I have always declined. This last week I got an invitation from a relative to join them for their 4th annual family triathlon. It's called the Boyce Ator Triathlon and commemorates my cousin's husband who was an avid triathlete who passed away in 1994 from cancer. 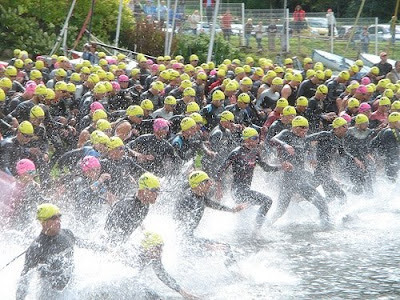 I was excited to learn that this mini triathlon is not the kind of intense competitive event where hundreds of guys in wet suits sprint from the start line and literally climb over each other while trying to swim the first leg. I was assured it is less of a competition and more of a recreational event due to the small number of participants and the emphasis they put on having fun. This is what has always scared me away from trying a triathlon. If you have ever considered participating in a triathlon but felt intimidated by it, then this would be the ideal event to give it a try. If you will be in the Provo/Orem area this Labor Day, then I invite you to join us September 3 at 7:00 a.m.. Not only is this a great excuse to get in shape, but it is also for a good cause, since any profits earned from the event will be donated to cancer research. The registration fee is a bargain, and you can get more details and register at Boyce Ator Triathlon. Completed the triathlon sprint on Labor Day and it was a blast. I'm looking forward to shaving some serious time off the next one I do.